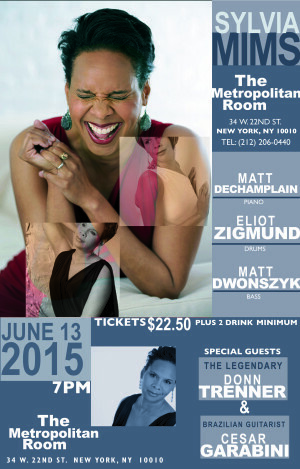 I will be returning to the Met Room on Saturday, June 13th at 7pm with performance to ring in summer 2015. So looking forward to playing with pianist Matt DeChamplain and bassist Matt Dewonszyk again. This time we will have drummer Eliot Zigmund with us, who has played with some legendary musicians including Bill Evans. We are so excited that Eliot is joining us. Special guests include Brazilian guitarist Cesar Garabini. We will do a beautiful medley of bossas. Also, on the the lineup is my friend and musical soul mate, Donn Trenner. Donn is wonderful human being and an outstanding pianist. The night would not be complete without having the magical Donn Trenner present.